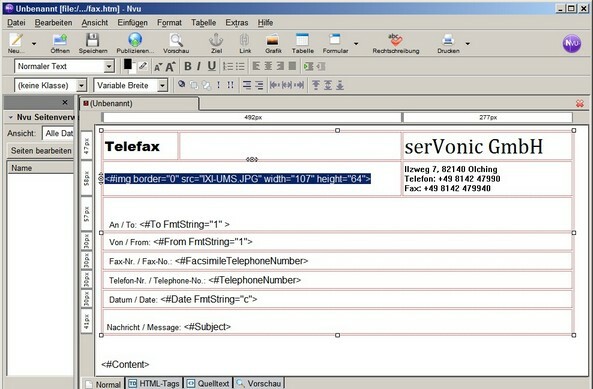 The fax coverpage is defined by the "fax.htm" and therewith is created in HTML-format. Please note that not every HTML-editor can be used. 1. Some HTML-editors insert unnecessary "tags" when creating the page, by which the coverpage cannot be processed any more. 2. The %PRODUKTNAME% Render Connector processes some "special" HTML-tags, which are not supported by any editor. Ideal is the use of Notepad (editor) for the change of the fax.htm. As grafical-based HTML-editor, the free "NVU" in version 1.0 has been tested. 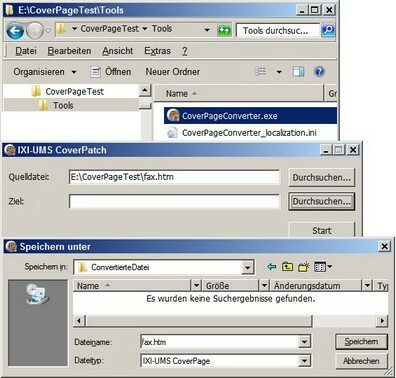 In order to remove the "tags" added by it or convert them into a character valid for the ixi-UMS Business Render Connector, a "CoverPageConverter" is added from ixi-UMS Business Version 5.85 on. The "Converter" is is deposited at "ixi-UMS Business Kernel\Rconn\Tools" after the installation. The language can be changed in the "CoverPageConverter_localization.ini". ·Please take care that the page is not too wide. ·The font types used must be available on the ixi-UMS Business Server. ·The font sizes should not be too small as there is a loss of quality with the fax sending. Store the page as "fax.htm" on the hard disk. The "page title" asked for then is irrelevant. Copy the folder with the "CoverPageConverter.exe" to the machine, on which the fax.htm is stored. Start the EXE by double-click. Select the destination folder, which may be the same one. Please take into account that then the "original" fax.htm is overwritten. When both folders are selected, please click on "Start". After the processing, a respective message appears. The picture is NOT displayed! If another coding is entered, please change this here. Restart the Render Connector and send a fax. Depending on the fax viewer and the use of a Layout.htm, only the printed part or a complete DIN A4-page are displayed with a TIFF-format. We highly recommend that you print the result and adjust the margins, if necessary.